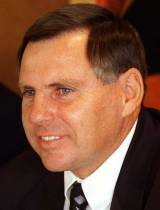 John Bernard Hart took the helm of the All Blacks between 1996 and 1999 and will be unfortunately largely remembered for their failure to secure the sport's biggest prize in the 1999 World Cup. But Hart experienced huge success at club level as he coached Auckland, despite coming from a business background, to NPC glory in 1982, 1984 and 1985 - securing the Ranfurly Shield from Canterbury in the process and starting a series of 61 defences which is a record to this day. Hart, alongside Alex Wyllie, was an assitant coach under Brian Lochore when the All Blacks tasted glory in the 1987 World Cup. Despite being part of the winning team, Wylle was the chosen man to take on Lochore's post - much to the disappointment of Hart and Auckland. Hart refused to be part of the selection panel but was appointed co-coach for the 1991 World Cup but failed to work in harmony with the Canterbury-focused Wyllie. Following the All Blacks' loss to Australia in the semi-finals, Wyllie fell on his sword but the NZRU favoured Laurie Mains over Hart. After their failure to secure the World Cup in 1995, Hart took on the role and achieved the All Blacks first ever series win in South Africa in 1996, and took the Tri-Nations three times in 1996, 1997 and 1999. But following their loss in the semi-finals of the 1999 World Cup to France, Hart left the post. For his services to rugby, Hart was appointed an Officer of The New Zealand Order of Merit in the 1997 Queen's Birthday Honours.